Cook sausage in large skillet. Drain sausage. Spray slow cooker with PAM. 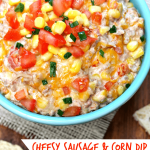 Add sausage, Ro*Tel, corn, cream cheese and shredded cheese to slow cooker. Cook on high for an hour before you’re ready to serve it. Mix about every 20 minutes or until cream cheese has melted. Turn down to low heat while everyone snacks on this amazing dip to keep it nice and warm.